The Wright Wreport: Gascony Whites: Fresh, Soulful. And Light on Wallet. Gascony Whites: Fresh, Soulful. And Light on Wallet. Michael York as the adventurous D'Artagnan in "The Three Musketeers." Photo courtesy of The Movie Scene. BACK in the '70s when we were kids, my brother and I skipped out to see Richard Lester's “The Three Musketeers,” arguably the best adaptation on film yet. What a cast: Charlton Heston, Oliver Reed, Faye Dunaway, Richard Chamberlain, Frank Finlay and, Michael York as the gangly d'Artagnan, that unruly lad from Gascony. Wild, unconventional – what my great Aunt Jim would call "countrified" – the young gascogne, a daring horseman and fencer, burst on the scene like a breath of fresh air, not unlike the white wines that hail from the same region. A fresh French white wine that’s not traditional Bordeaux blend? Not everything needs to be haute culture these days. And if truth be told, we all LOVE an excellent value. That's modern-speak for a good cheap drink. Well here it is, folks! Welcome to the white wines of Gascony. 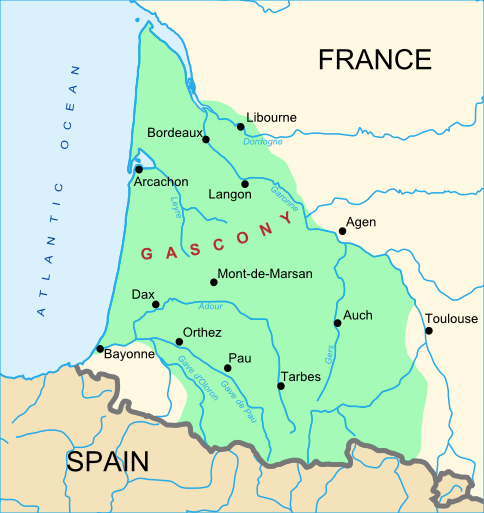 Gascony is a rugged land on the edge of the Pyrennes. Photo from Wikicommons. Gascony wines had been famous for centuries, but when the ale-loving English controlled the region for all of those years (remember Eleanor of Aquitaine? 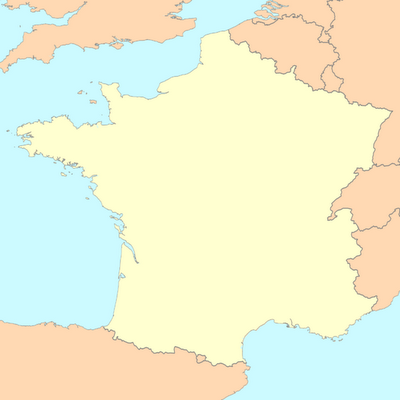 Speaking of movies, remember Kathryn Hepburn in “The Lion in Winter?” But I digress), the Gascony wines lost ground to their Bordeaux brothers just to the north. But recently, the best-kept secret of regional French wines has begun to make a comeback. Skeptical? So was I, especially when the bottle was on sale for $4.99. What good can possibly come from a $5 bottle of wine? It's like the 99-cent burger: possibly edible but often barely. I braced for impact as the salesperson assured me that, no – really – it's a great little bottle of wine. Cote de Gascogne Blanc combines fruitiness and minerality to pleasing effect. Photo courtesy of Woodland Hills Wine Co. Still skeptical. So in such cases, always have a backup plan: the backup bottle in case the wine should prove to be this side of lethal. But d'Artagnan sprang mightily from the bottle. Light, refreshing, smacking of a touch of Sauvignon Blanc two-stepping with Pinot Grigio, the wine pared perfectly with seafood: not too fruity, not too minerally, not too wimpy. It had its own personality. Again, I would pause upon seeing rock-bottom low prices. Again I would buy the Plan B backup bottle. Again, I was consistently surprised by the freshness, crispness, lightness, but soulful quality of these wines. I have a lot of Plan B bottles now. A little slow on the uptake, but it hit me: Galloping Gascony, these wines need their own article! Et voilà. 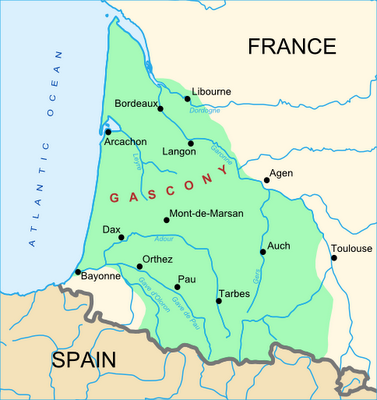 Gascony is located on the French side of the Spanish Basque region, an area once controlled by the English who did not have a huge appetite for wine. Photo courtesy of Wikicommons. The good news is this: The wines are beginning to catch on. The bad news: in some places they have already caught on. That special introductory price for the Domaine des Cassagnoles: all gone. It's now $10. Looking across the Web, many Gascony wines are now in the $10 range but they are wonderful buys for an everyday wine. Buy a case. Believe me, it'll be gone in six months, long before the wine slips past prime. Imagine the wines that predominate in Cognac, but being served up fresh without all that fermentation. That’s Domaine des Cassagnoles’ Cote de Gascogne Blanc. An odd balance of fresh fruitiness (grapefruit and lime), but with a hint of minerality and not a lot of sugar, the wine matches perfectly with saltwater seafood. Scallops, shrimp, nice full pieces of fish – look out! A wonderfully refreshing casual drink. La Galope is typical of Gascony wines – fresh and refreshing. Photo from K & L Wine Merchants. Oh those wild unwieldy Gascones! Still waiting for this bottle to come in, but with references to the horseback riding D’Artagnan, how could I not include La GALOPE? Details to follow upon arrival. Take the standard Sauvignon Blanc and add a touch of the sea, the barest hint or whisper of saltiness. That and a nice piece of halibut would go down perfectly: a simple, good, wine for simple hardy fare. I would like to know if you have tasted La Galope Sauvignon? Hello ... I am just seeing your note and will pass it along to Tamara. Thank you for your note and thanks for reading the article. Sadly, La Galope Sauvingon Blanc blend is completely out-of-stock. But keep your eyes open: there will be some very delicious white wines coming up in VEVLYN'S PEN soon!